The world of graphic design is a fascinating one, serving as both sponge and mirror to the broader world of technological and social change. Truly, the rate of change is enough to make one’s head spin. So much digital ink is spilled on the fads and trends du jour, we thought we’d take the long view for a moment and consider what graphic design will look like not 5, or 10, but 20 years down the road. Here is 99designs’ unofficial projection of the graphic design landscape of 2033, as outlined by 13 not-so-shocking developments. The Microsoft Surface (left) employs flat design; in 2033, design will have ditched the visual altogether (right image by Christophe Verdier). “Flat design” is a major buzz word these days, referring to the use of sleek, perfectly 2D web design elements that make no use of gradients, shadows or anything else that implies 3-dimensionality. By 2033, even this is bound to seem clunky and abrasive; user experience designers will be tasked with finding something more elegant than banal visual shapes. In solution, “ethereal design” will do away with the visual element entirely, instead making use of auditory tones, tactile signals and the 4th dimension, time, to guide users around a website, giving eye balls a much needed rest. Today, 1960s-style designs, such as this one by La Carbonera Design (left), are retro cool; by 2033, 15th century-style designs will be in (right photo by Penn Provenance Project). Vintage logo designs, inspired by the blissful consumerism of the 1960s or the rugged, frontiersman-chic stamp emblems of the late 19th century, are all the rage nowadays. But soon the recent past will lose its novelty, and logo designers will have to find a way to renew the vintage look. Well, there’s only one way to go and that’s backwards, so look forward to a crop of hip designs invoking medieval design — feudal family coats of arms, regal seals and ornamental scrolls. Once there, hieroglyphics aren’t far off. Blocked image-style sites like Pinterest are gaining popularity; by 2033, text will seem totally unnecessary (emoticon by guyfromscotland). Since the image sharing website Pinterest exploded this year, the website’s style of brick-like, solid blocked images has become pervasive in website designs. If there’s one thing that Pinterest has revealed, it’s that words are superfluous, even somewhat undesirable for a global community that does not share a language. Rather, all you need are images, hyperlinks and perhaps emoticons to get the world communicating. By 2033, the post-linguistic society is going to be in full swing; welcome to the digital Chauvet Cave. Today, responsive design responds to screen size (left image by John Polacek); by 2033, it will also take the user’s emotional state into consideration (right image by JLM Photography). Today, few things rank higher on the list of a web designer’s priorities than “responsive design” — layouts that adjust themselves depending on the size and shape of the screen the viewer is using, whether it be a desktop, tablet, mobile phone, etc. Well guess what. We are not devices. We are human beings, with flesh and blood and feelings. By 2033, developers will have grasped this and will take “responsive” to the next level, creating sites that adjust not only based on screen size but on the viewer’s personality and mood. Is the user agitated? Deploy the cool blue background to calm him down. Hold us, Siri. Who says text blocks have to stick to 1 boring typeface? By 2033, readers will embrace typeface diversity at every turn (left image by dabblelicious; right image by Kitchen Sink Studios). We’ve noticed a lot of design work lately that takes a multi-type approach, juxtaposing striking but dissimilar typefaces to grab the viewer’s attention. This seems like a real win, and we fully expect the approach to revolutionize the world of typography more generally. Books, for instance. For centuries we’ve had to put up with the tearfully dull convention of 1, maybe 2 typefaces per page. Well, to heck with that! In 2033, every word on every page will be allowed to wear a different typeface, existing in happy ragtag harmony. 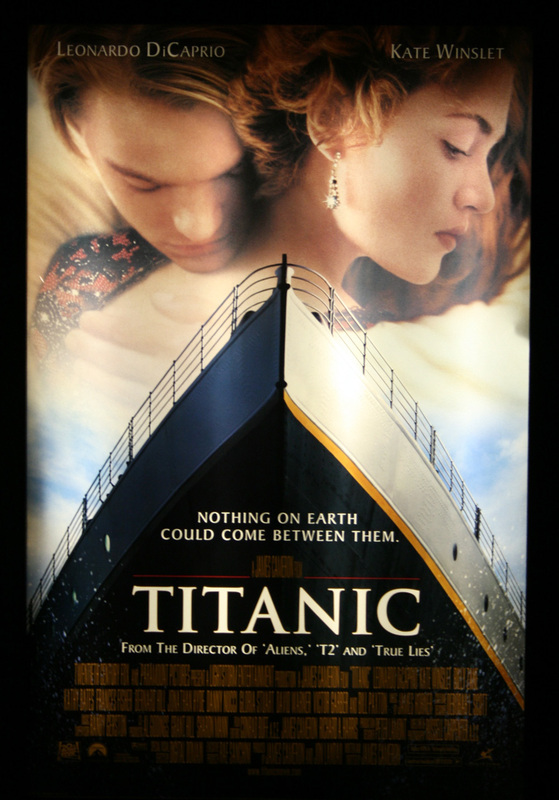 The mid-90s Titanic poster (left) will seem overwhelmingly dense compared to the über-minimal poster designs of 2033, like this one by Pedro Vidotto). Commercial movie posters tend to be anything but subtle. In the just-for-fun graphic design world, however, a wave of artists are reacting with an ultra-ultra-minimal aesthetic that boils down a narrative to a single iconic element and leaves it there. As films themselves become more and more hyper-stimulaitng with ever-improving surround sound and 3D technology, it stands to reason that posters will assume the opposite trajectory — people can only take so much visual noise! By 2033, the so-called “minimal” poster projects of today will seem cluttered by comparison: the posters of 2033 will be so simple, they may consist of nothing but a particular shade of blue-grey, offering pre-emptive relief from the seizure-inducing film it advertises. Nicholas Felton’s annual Feltron Report (left) prefigures the Orwellian info-world of 2033 (right image by jk5854). “Infographic” has proven a lasting addition to the designer dictionary; they are a slick, effective new way to present information. By 2033, the humble .gif animation will be the default means of advertisement (.gif by sassacats). .gifs are irresistible. Whether you’re looking at a slick cinemagraph advertisement or just a looping cat video, it’s mighty hard to turn away. And yet, today the .gif still occupies a relatively marginal position in visual culture. By 2033, nothing will be farther from the truth. Not only will .gifs become the preferred means of billboard advertising and physical comedy, but it will have gained status as a legitimate art form, earning itself a category in the academy awards. Visitors to Times Square in New York will find themselves in a spastic sea of looping kitten videos. Soon there will be so many typefaces, typographers will have to distinguish themselves by creating increasingly outlandish products, like the above image by Oded Ezer. With easy-to-afford and easy-to-use typesetting software, the rate of new typefaces being produced nowadays is simply staggering. We don’t know the exact numbers, but to make a semi-educated guess, we’d place it at a good handful every day. The fact is, it’s already tough to distinguish between some typefaces, which are differentiated by the slightest of inlets, serif lengths and l-heights. By 2033, typographers are going to be stepping on each other’s toes like awkward high school prom dates. Some will turn to focus on outlandish winding-style typefaces. The rest will enter a frenzy of cannibalistic litigation, eventually running the country of Switzerland into bankruptcy. In an unexpected shift of Europe’s geopolitical scales, the small country of Liechtenstein will then purchase its bordering neighbor for a small sum. Ebay and the University of California met fierce opposition to their recent logo re-designs, causing the UC to retract theirs; by 2033, trying to re-design a beloved logo will become virtually impossible. As the graphic design peanut gallery has become better connected and more vocal, galvanized by critique sites like Under Consideration’s “Brand New”, we have witnessed unprecedented amounts of knee-jerk opposition to new things. The logos for the London Olympics, University of California and South Australia each received a mountain of hate, with the UC being effectively booed off the stage. By 2033, this state of reactionary conservatism will be so intense, it will be impossible for any beloved company to ever re-brand. So you had better get used to the logos we’ve got, because they’re here to stay. Destination branding is hot. It’s also getting mighty specific, with not only regions but also city sub-districts and even train terminals getting their own logos. By 2033, things might get out of hand. Another hot topic of 2013 has been destination branding — initiatives by cities all over the world to draw more tourism through the creation of a sleek and coherent graphic identity. Some destination brands have gotten even more specific than the metropolis, such as Victoria subdistrict of London and Grand Central Station in New York City. Like they say, nature hates a vacuum. By 2033, no destination, no matter how local or insignificant, will be without its own identity scheme. The Northwest corner of the playground in Dolores Park will raise its unique emblem high. Brand New’s Armin Vit will analyze it with a mixture of snark and lukewarm approval. Stock image concepts are getting strangely specific. By 2033, the store will be so vast, there may be no need for photography of any other kind (ffffound.com). There is no shortage of stock photography. In fact, that is a crazy understatement. From an angry boy who is being written up to a labrador retriever pooing with sad eyes, it already seems there is a stock image portraying every scenario that could possibly exist, and then some. By 2033, stock photographers will have staged every humanly conceivable natural circumstance, so there will no longer be any need to have photographers “on the scene.” Whatever the scene may be, you can bet that a perfect simulation will have already been shot in advance, in perfect lighting, and the exclusive rights can be yours for just a small fee! Dentists, chiropractors, yoga studios and law firms may not have the most exciting logos today, but by 2033 they will be the edgiest of all. Sadly, today these businesses seem to receive a disproportionately small slice of the creativity pie. What we see is the opposite of edgy: a sad, safe stock of abstract teeth, spines, yoga poses and conservative typographic word marks. But wait! In a dialectic turn of events, by 2033 these industries will have experienced an unforeseen design renaissance, establishing themselves as avant-guard with designs that are daring, experimental, at times even shocking. Heaven be praised, the dark ages will be over. What do you think graphic design will look like in 2033? Hilarious! I’m sure that was your intention? All jobs will be outsourced to India. What you want to say. what about future of graphic designer ? As far as I know and have experienced, desktop publishing and printing industry will still remain. It’s just a fast 17 years away from now – SO NO REAL BIG DEAL. In terms of creativity of designers in 2033, it’s going to be fluid, many more will be lazy and there will be more self-proclaimed designers and photographers. With all these ridiculous ‘predictions’, you forgot #14: In 2033, all design will be done on 99designs, rather than by actual professionals… you know, professionals like Armin Vit of Brand New. There are not many things that damage Tim Ferriss’ credibility, but his sponsorship deal with 99designs.com does just that. Probably not. Computers are notoriously bad at art and creativity.